The all new KeyLogger Flash USB is an advanced USB hardware keylogger with a huge 2MB internal flash memory, organized as a file system. 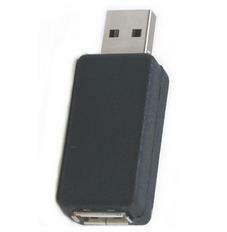 All text data typed on the USB keyboard will be captured and stored on the internal flash drive is a special file. Text data may be may be retrieved on any other computer with a USB port and keyboard. Super fast data retrieve is achieved by switching into Flash drive mode for keystroke data transmission. This hardware keylogger is 100% transparent for computer operation and no software of driver are required. Ultra Compact and Discrete, only 1.5" long.